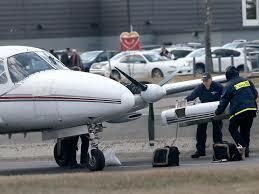 Fuel mismanagement was the cause of a forced landing by a Piper Navajo on a Calgary street earlier this year. The Transportation Safety Board found the pilots neglected to switch from the outboard to inboard tanks while setting up for Calgary Airport on a flight from Medicine Hat. The TSB investigator found the outboard tanks were empty but the inboard had plenty of fuel in them. The investigator also found there was a discrepancy between the pilot operating handbook and the internal procedures of Super T Aviation, which operated the flight. Super T has amended its procedures. The Navajo was carrying two pilots and four passengers when it was put down on a main street in northwest Calgary before 6 a.m. so there were few cars on the road. The aircraft damaged a wing on a lamp post during the rollout.